Why is 2018 the International Year of the Camelids? Iñaki Vazquez: The Internet of Things: "Ch@nge"
Four centuries after Galileo Galilei discovered with astonishment four moons around Jupiter, space probes and powerful telescopes have allowed us to learn facts that would never have crossed the mind of the Italian astronomer, such as the volcanic surface of Io or the underground oceans of Europa, Ganymede and Callisto hidden under icy crusts. Two new missions of the European Space Agency (ESA) and NASA promise to uncover more surprises about the Jovian moons in the coming decade. “I’m afraid Galileo would have had a heart attack after seeing what we have learned about his moons and what equipment is at our disposal now,” jokes Dmitri Titov, an ESA scientist, to OpenMind. Among the 69 moons that today we know orbit around Jupiter, astronomers continue to differentiate four from the rest. They are Io, Europa, Ganymede and Callisto, which Galileo discovered on January 7, 1610 with his telescope. In his major work, Sidereus Nuncius, he refers to them as “Medicean Stars” in honour of his patron, Cosme II de Médici. It was the German astronomer Simon Marius who gave them their current names. The moon closest to Jupiter, Io, at a distance of about 422,000 kilometres, is the most active body in the solar system. The cause of this geological activity is the heat created by the gravitational attraction it feels when it is between the planet and the other large moons —Europa and Ganymede. 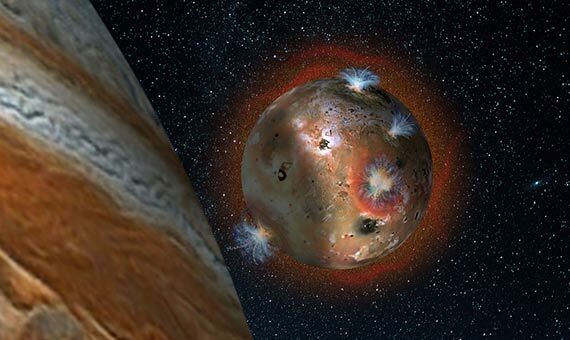 Artist’s concept of the atmospheric collapse of Jupiter’s volcanic moon Io, which is eclipsed by Jupiter for two hours of each day. Credit: SwRI/Andrew Blanchard. Io’s permanent volcanic activity prevents craters from forming and gives it those striking colours. Terrestrial telescopes have revealed that its atmosphere fluctuates when the orbit places it in the shadow of the planet. This thin layer, composed mainly of carbon dioxide emitted by volcanoes, collapses when eclipsed by the gas giant but is restored once again when the moon receives sunlight. Though the smallest of the Galilean satellites —with a mass 0.008 times that of Earth— Europa is the most promising. Under its icy crust lies an ocean where conditions for life could exist. The expert says that ESA’s JUICE mission, to be launched in 2022, will study the composition of this ocean, the thickness of its frozen crust and the possible geological activity. What we know from other instruments such as the Hubble Space Telescope is that the satellite emits steam geysers up to 200 kilometres high. 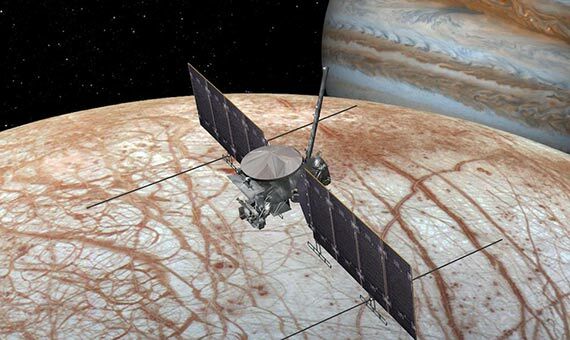 NASA’s Europa Clipper mission, which will orbit the moon in the 2020s, also hopes to answer some questions about this satellite. “I am interested to see what this mission can tell us about the characteristics of the icy shell and ocean. I also hope that it will see plumes and confirm the Hubble observations,” says Marcucci. Ganymede can lay claim to being the largest and most massive satellite of Jupiter and also the whole solar system. In addition, it has an internal magnetic field. “The interaction of Ganymede’s magnetic field with that of Papa-Jupiter is the unique case in the solar system,” notes Titov. As with the moon of Europa, the data from probes reveals that it conceals a liquid ocean beneath its icy crust, which could measure hundreds of kilometres, hindering access to the body of water in future missions. Some research suggests that water and ice could be distributed in several layers, like a sandwich. It is estimated that the ocean contains more water than there is on the surface of the Earth. With the JUICE probe, ESA will also fly over this moon in the coming years and try to collect data that explains the origin of its magnetic field. Bonneville highlights the complex surface of the satellite, with dark areas containing many craters and younger areas with cracks and cliffs. The Galilean moon farthest from Jupiter is Callisto, whose most characteristic feature is its surface dotted with numerous craters. “Callisto has the oldest surface and can be used as a witness of the early solar system,” says Titov. According to Marcucci, the preservation of the craters indicates that there have not been phenomena on the satellite that have erased them over time, like volcanoes, which shows the lack of geological activity. Like Europa and Ganymede, Callisto has a crust of ice under which there appears to be a liquid ocean. The JUICE probe will orbit it on its way through the Jovian worlds. Scientists are looking forward to the launch of the spacecraft, since it will be the first European mission to the giant planet and its moons. “JUICE is a fantastic mission for Europe, and we can’t wait for the results, and I am sure we will get surprises,” Olivier Witasse, a scientist at ESA’s JUICE mission, tells OpenMind.